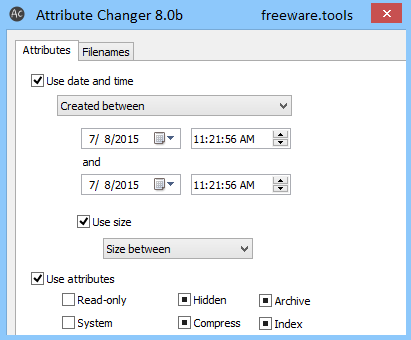 As the name suggests, Attribute Changer allows users to quickly and easily change the attributes of files and folders. Its seamless integration into Windows makes it a good choice for users who frequently need to make these types of changes. Once installed, the program is accessed by right-clicking on the file or folder in question. From there, the program opens, with its functions organized into tabs for folder properties, file properties, reporting, and settings. The program allows users to change the file type (hidden, compressed, read-only, and so on) and adjust date and time stamps. With the help of Attribute Changer you can not only modify file attributes but also date and time stamps. This is an advanced and highly intuitive application that integrates into the Windows Explorer shell to grant you easy access to a file's properties. Notable features include automatic reports for keeping track of tampered files, along with a simulation mode for previewing changes. More importantly, it offers support for batch processing, so you can modify attributes for a selection of multiple files (regardless of their format). After a rapid and uncomplicated setup operation, Attribute Changer creates an entry labeled "Change Attributes..." into the right-click menu and organizes its options into three panes dedicated to the customizable file properties, reports, and program settings, respectively. It's possible to mark file attributes (read-only, hidden, system, compressed, archive, index), as well as to convert the file name, extension or both to uppercase or lowercase. Date and time stamps can be modified for the filesystem (creation, last modification or last access) and pictures. Alternatively, you can update just parts of these stamps (day, month, year, hours, minutes, seconds) as well as generate random stamps based on a date and time range. Those who want to fiddle with advanced settings may apply filters for the date and time (e.g. created between..), along with size (between.., smaller than.., larger than..). What's more, you can create exception lists with file names, whether you want to include or exclude all files (extensions can be grouped together). Any modifications made are automatically recorded in reports. You can ask the app to save file and folder related settings on exit and load them on startup, sort the results list, disable detailed reporting mode, or append the menu to the context menu's end. Taking all into consideration, Attribute Changer proves to be a resourceful and simple-to-use application for modifying various file properties.